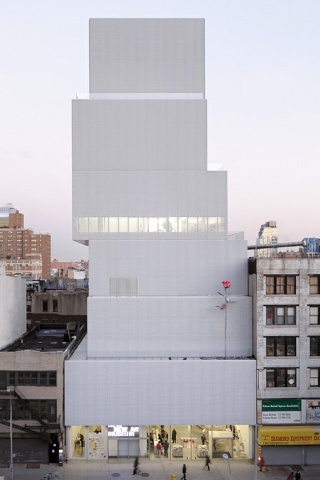 Standing twenty-eight feet tall, acclaimed German artist Isa Genzken’s Rose II (2007) is the second sculpture to be presented as part of the New Museum’s ongoing Façade Sculpture Program since the building’s completion in December 2007. Photo: Dean Kaufman This is Isa Genzken’s first public artwork in the United States. A crucial figure in postwar contemporary art, Genzken is a sculptor whose work reimagines architecture, assemblage, and installation, giving form to new plastic environments and precarious structures. The artist represented Germany at the 2007 Venice Biennale and has shown her work in leading museums across Europe. She was among a group of prominent international artists featured in the exhibition “Unmonumental,” the survey that inaugurated the New Museum’s SANAA building. Rose II was originally created in 1993 and reprised in 2007. It is the culmination of a practice that explores the way we perceive objects and images through our senses, the implications of scale, and the integration of architecture, nature, and mass culture. Although Genzken is a longtime resident of Berlin, she has had a forty-year love affair with New York City, which began when she first visited as a student. Looking back on that experience, she has commented, “To me, New York had a direct link with sculpture…. (It) is a city of incredible stability and solidity.” The installation of Rose II can be seen as a tribute to a place Genzken continues to love. The New Museum Façade Sculpture Program is made possible by an endowment established by The Jacques and Natasha Gelman Trust. Rose II is on extended loan, courtesy David Zwirner Gallery, New York. The first artwork for the Façade Sculpture Program was Ugo Rondinone’s Hell, Yes! (2001), which was unveiled on the façade to celebrate the opening of the New Museum’s first freestanding building at 235 Bowery.